Please read Terms and Conditions below. Entry to the prize draw is open to UK residents with children aged between 6 and 12, excluding employees of Harrods, its agents or anyone professionally connected with the promotion, and their immediate families. To enter, entrants must visit the Royal Mums Instagram page at https://instagram.com/royalmums/?hl=en and like and share the Magical Moonlight Feast Graphic post between 15 October 2015 and midnight on 19 October 2015. There will be 3 winners. 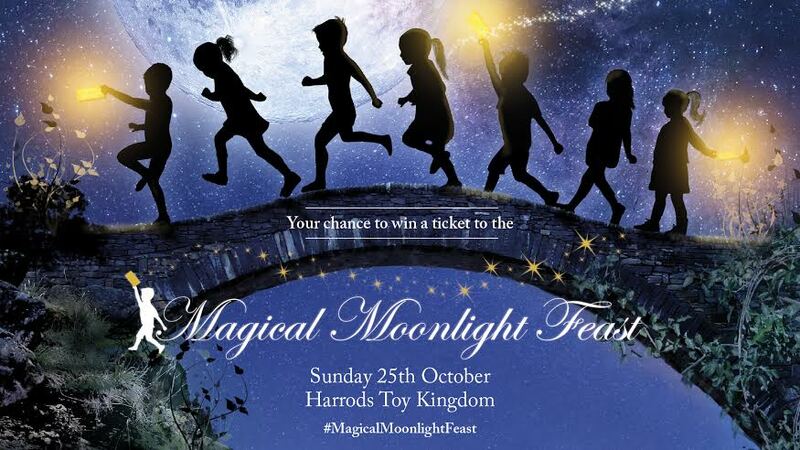 Each winner will receive a ticket to the Harrods Magical Moonlight Feast taking place between 7-9pm at the Harrods, Knightsbridge Store, on 25 October 2015 (the “Feast”) (the “Ticket”). Ticket does not include transportation to and from Harrods. Each Ticket admits two children aged between 6 and 12 and one adult (over 18) (the “Guardian”). The Guardian must be either the parent/ legal guardian of the children they are accompanying or must have the permission of the parent/legal guardian of the children they are accompanying to attend the Feast and to provide the consents herein. Tickets must be registered by the Guardian by emailing magicalmoonlightfeast@harrods.com and filling out and returning the registration form emailed back to them by midnight on 24 October 2015 (in accordance with instructions from the Prize Provider). Tickets which are not registered by this time will not be valid and will not permit the ticket holder or their guests to attend the Feast. Winners must show their registered Ticket prior to entry to the Feast. In the event a winner is unable to provide their Ticket to the Feast, none of the party registered to the Ticket will be permitted to attend the Feast. Additional terms and conditions apply to the Feast and can be found at http://www.harrods.com/content/shopping/terms-conditions/ under the heading Harrods Magical Moonlight Feast Event Terms and Conditions. The 3 winners will be randomly selected from all qualifying entries on 20 October 2015. Winners will be informed that they have won on 20 October 2015 by direct message to their Instagram account and will be given instructions regarding how to claim their Ticket and to arrange for delivery of their Ticket. If a winner cannot be contacted due to incorrect/incomplete contact details and/or does not claim their prize by 21 October in accordance with the instructions of the Promoter and/or the Prize Provider, the Promoter reserves the right to select another winner. No correspondence will be entered into regarding the selection of the winners. Promoter and/or the Prize Provider reserve the right to request proof of identity of the winners. If a winner cannot provide proof of identity to Promoter’s or Prize Provider’s satisfaction, the winner’s entry will be deemed invalid and Promoter reserves the right to select another winner. Promoter accepts no responsibility for late, lost, incomplete, incorrectly submitted, delayed, illegible, corrupted or misdirected entries, entrants’ contact details which are incorrect or incomplete, claims or correspondence whether due to error, omission, alteration, tampering, deletion, theft, destruction, transmission interruption, communications failure or otherwise, or inability or delay to contact a winner. The Tickets will be registered to the names stated at the time of registration and cannot be changed after registration. Tickets have no cash value and cannot be exchanged, transferred or redeemed for cash or any other prize. By entering this prize draw winners agree to their name being published as a winner. Harrods Limited (“Prize Provider”) may take photographs and/or video footage during the Feast for marketing and promotional purposes (both internal and external) (“Promotional Material”). Unless indicated otherwise on the registration form, by registering the Ticket and attending the Feast, the Guardian consents to the Prize Provider using these photographs and/or video footage and the image of themselves and the children attending the Feast with them in such Promotional Material without restriction and without any compensation. In the event that the Guardian does not wish the photographs/videos of themselves and their accompanying children taken at the Feast to be used in such Promotional Material, they must indicate this in the appropriate place on the registration form and ensure that they and the children they are accompanying receive and wear for the duration of the evening a “No Photography” sticker. Food and drink available at the Feast may contain allergens including, without limitation, dairy, eggs, nuts, gluten, wheat and soya. The Prize Provider shall not be responsible for any adverse effects resulting from food or drink consumed at the Feast (including but not limited to allergic reactions) or for any other loss, damage or injury suffered, sustained or incurred by an attendee, or any loss or damage to property as a result of attending the Feast. Promoter reserves the right to cancel the prize draw without notice. This prize draw is in no way sponsored, endorsed or administered by, or associated with, Instagram and by entering this prize draw entrants release Instagram from any liability which may arise as a result of this prize draw. By entering this prize draw, entrants agree to adhere to Instagram’s terms and conditions at: https://help.instagram.com/478745558852511. The Promoter of this prize draw is Royal Mums: info@royal-mums.com (“Promoter”).